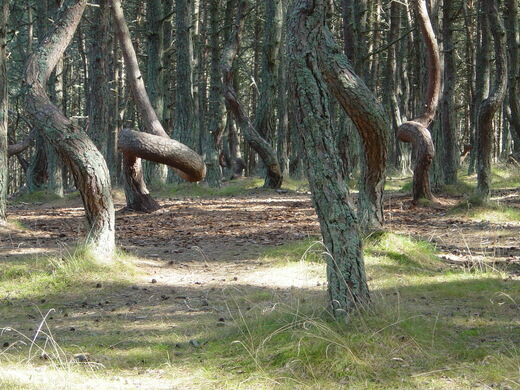 The reason for the strange contortions in the trunks of these "drunken" pine trees in Russia is still a mystery. 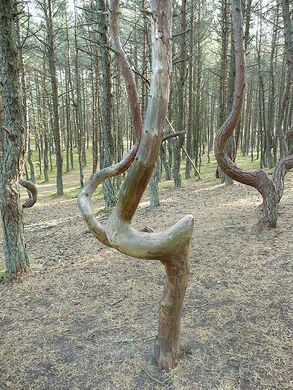 Between the Baltic Sea and the Curonian Lagoon, on the Kruglaya Dune of the Curonian Spit, there is a forest where the pine trees seem to be doing the twist. 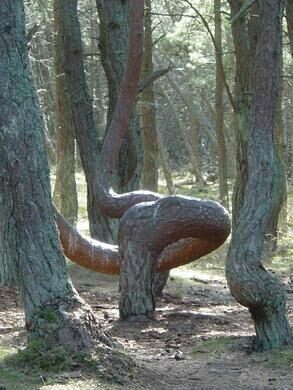 Dozens of trees in the Dancing Forest of Russia have trunks that are contorted into rings, spirals, and other loops and squiggles, and the reason for this mysterious malformation is not known. The trees were planted in the early 1960s to stabilize the dune sand, but the unstable sand is one explanation people posit for the trees seeming so unstable themselves. 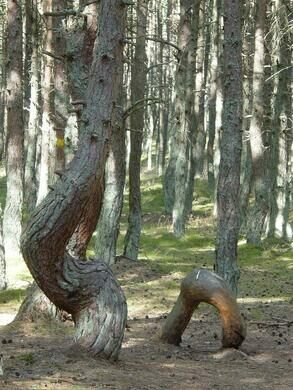 Locals call the crooked wood the Drunken Forest. Studies have been done to try to determine the exact cause, though results are inconclusive. 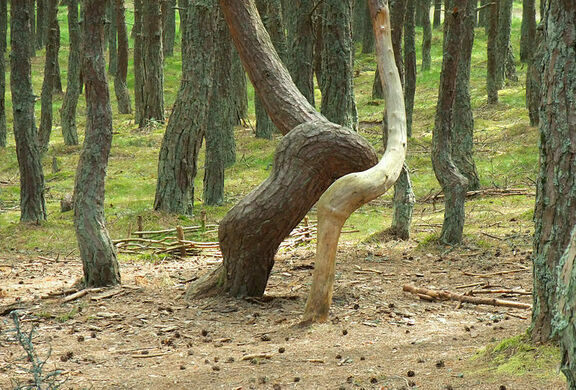 The leading scientific theory is that pine shoot moth caterpillars damaged the pine shoot’s apical buds at an early age causing them to start out growing at an odd angle, from their lateral buds. Since plants naturally grow toward the sun, they eventually corrected themselves and started growing up again, but with their new deformities intact. Some blame strong winds, others manipulation by humans. 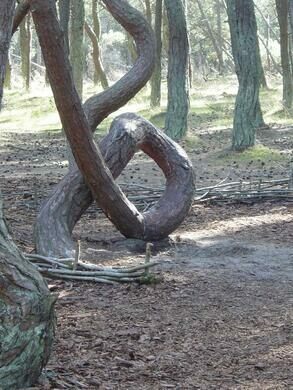 The supernatural-inclined have suggested that the forest is in a place where positive and negative energies clash and that these forces have manipulated the shapes of the trees. 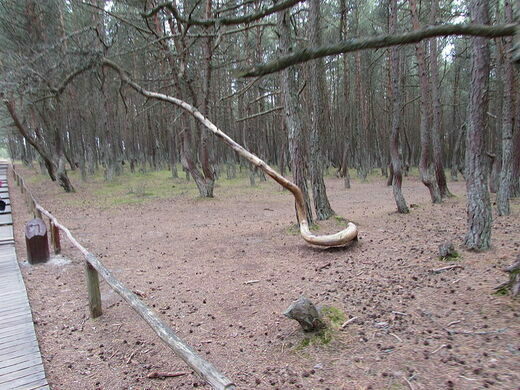 Some say that the trees willfully follow the movements of the dune sands. 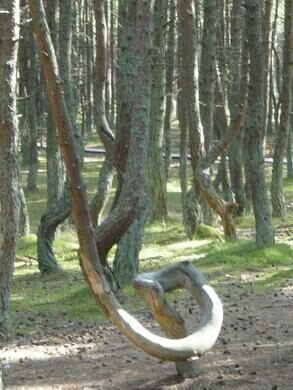 One local legend says the dancing trees twist and bend because centuries ago, on that very spot, trees were made to dance in order to prove the power of the Christian God. 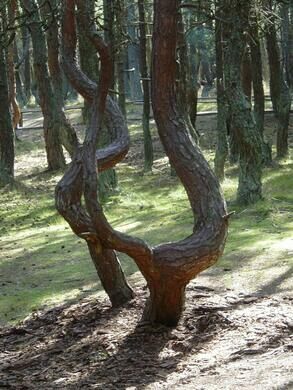 Superstition fuels many of the theories, and has also made the Dancing Forest a popular source of hope: Climbing through one of the rings has been said to add a year to a person’s life or earn that person a granted wish. A narrow strip of land is home to the tallest migrating dunes in Europe. A small part of Russia that does not touch any other part of Russia.